1) Remove Wan Hua Noodles (Chow Mein, Stir-Fry, Miki, Udon, Yakisoba, or Vegetable Noodle ) from the package and gently separate. 2) Heat oil in pan over high heat, and saut? garlic. 3) Toss in vegetables and stir-fry until tender. 4) Add the entire package of noodles into pan, then incorporate sauce and water. 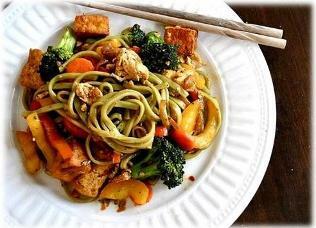 5) Stir-fry all ingredients together until mixture is completely heated through.